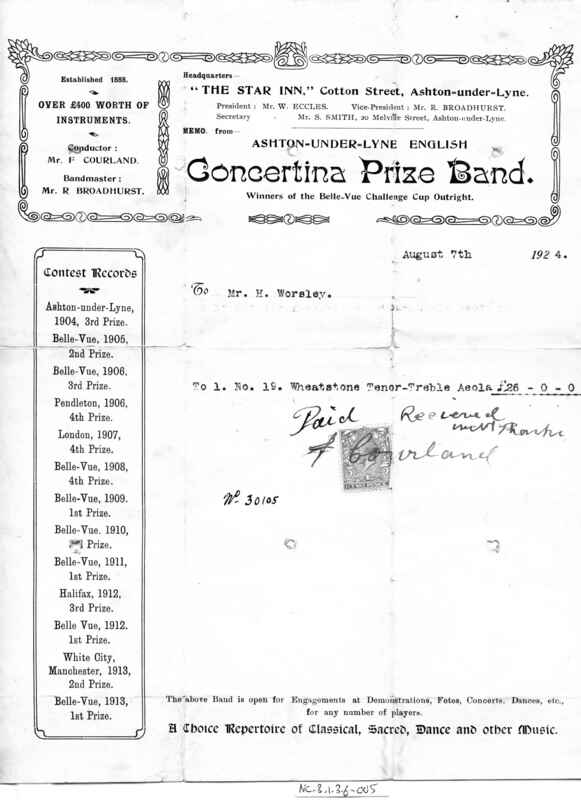 Full Description: The Alfred and Herbert Worsley/Ashton-u-Lyne Concertina Band Archive: A Band Letterhead of the Ashton Band, being a receipt to H Worsley, dated Aug 7th 1924, for a No 19 Wheatstone Tenor-Treble Aeola, and priced at £26-0-0. Annotated in ink No 30105, and accompanied by a modern print from the Wheatstone ledgers showing the instrument as made 29th Feb 1924, as a “Black 56 Keys, 7½ S.V.W.S”. The letterhead lists many of the Band’s victories, Conductor& Bandmasters’ names, and various addresses.